It's all well and good to retweet the nice things people say about your business on Twitter, but you're reaching a limited audience. The only people seeing your tweets are the ones who opt to follow you. How to broadcast those tweets to a bigger audience, then? That was the question facing Firehouse Agency when its client Stripes Convenience Stores decided to do a big push promoting tacos, the Texas chain's most popular product. The agency thought a good way to do it would be to publicize the positive feedback Stripes had gotten for its tacos on Twitter, letting its customers essentially become its copywriters. And so Firehouse came up with this idea: Put those Twitter conversations up on digital billboards for all of Texas to see. Working with Lamar Advertising, Firehouse combined two of the hottest areas of media right now, social and digital outdoor. "The agency monitors any conversation happening on Twitter about @stripesstores and their tacos," says Lamar digital strategist Ian Dallimore. "The tweets are then sent to Lamar’s data feed manager, where the tweets are filtered and stream live to the digital billboard." This week eight billboards across Texas began running the campaign. The campaign, which will run through March 3, uses Lamar's iSpot technology, which allows billboards to include live data feeds. The tweets are usually simple, and rarely poetic, but they get the point across: Stripes makes tasty tacos. "Best tacos ever!" one tweeter says. The billboards are in six markets: Corpus Christi, Brownsville/Rio Grande Valley, Laredo, Lubbock, Midland/Odessa and San Angelo. What makes this campaign work is that the tweets come from regular people instead of the company's copywriters, which makes them seem all the more convincing. Peer endorsements just ring truer, which why they are now so much a part of the fabric of the web. 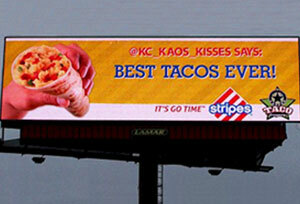 The Stripes taco campaign is just the latest example of how digital outdoor and social media can be used effectively in ways no one could have imagined just several years ago, thanks to advance in digital billboard technology. 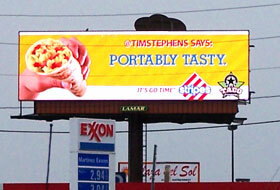 Billboards can now post live Facebook feeds or be recognized on FourSquare or send text messages to passing phones. The original article appeared on Media Life Magazine's website. Stripes Convenience Stores are having an open conversation with their customers on Twitter and displaying it for everyone to see, thanks to Lamar Advertising and Firehouse Agency. 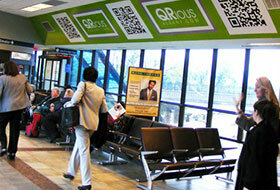 Lamar Advertising Company tests the visibility and effectiveness of 2-D bar code technology in Albany, NY.